Our personal check desk sets are formatted to 3-On-A-Page and are designed to fit in a 7-ring binder. 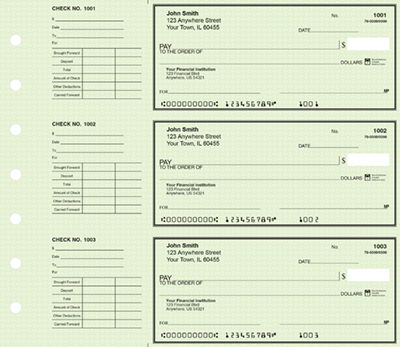 Detached checks are 9-1/2" x 2-3/4" with the stub attached and 6" x 2-3/4" without the stub. This is a perfect choice for those who want to enjoy the features of business checks with their personal checking account - and the Green Safety design is a classic choice for personal checking! This Green Safety Desk Set Personal Check meets or exceeds all US banking regulations and comes with a 100% quality guarantee. Every check has the latest in built-in security features and are printed on a top quality 24 lb. recycled paper. Save Up To 70% Off Bank Prices! Quality & Service - It's Our Promise!